Whenever any of my blog followers want a recipe, they just write to me and I am glad that I get all these requests. It gives me the opportunity to bring out the old recipes and wipe out the cobwebs. Fried snacks are hardly ever made in my house considering we are just 2. Its only when I have guests that I make fried snacks. My cousin requested for the dhebra recipe and sorry it took a while. I had the recipe but had to make it to photo the end product. Now that took a while. In the meantime the maize flour, millet flour were all patiently sitting on my kitchen counter. Finally got down to making them yesterday and they brought back a lot of memories especially of my mum. She would make tonnes of dhebras for our huge family all by herself. Its my favourite snack, but then I love all fried snacks or farsan as we call it. Some gujarati communities call them vada but we Patels call them dhebra. How do you distinguish them from the other methi dhebras we make…. well in our home it was small dhebra and green dhebras. Small dhebras was originally considered as travel food. 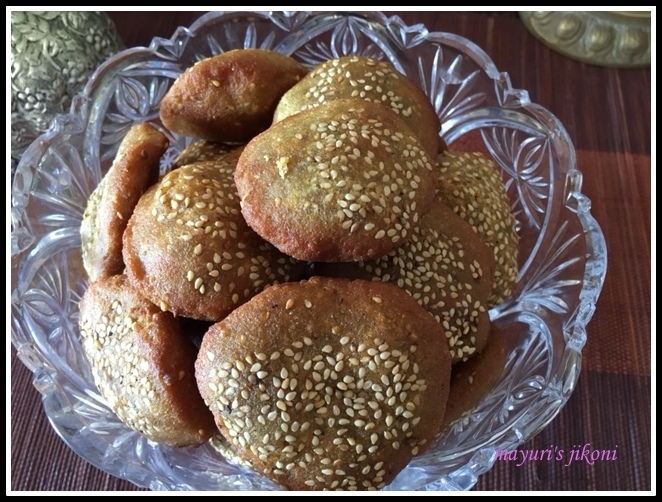 The dhebras were made with tamarind paste and jaggery and would stay for days without getting spoilt. Have it with sickly sweet tea, coffee, yogurt or on its own. People travelling by ship long time ago would pack a whole tin and I mean a big tin full of dhebras. My mum use to make them when we would travel to Mombasa. Dhebra and coke is what we would have. Dhebras are also made during weddings especially to serve to guests during the pithi, mandap roopan and graha shanti vidhis. Why dhebras are specially made then, I have never got a correct answer from anyone…. most say they don’t know.I guess because its one snack that can be made ahead and doesn’t get spoilt quickly. Any opinions or explanations? Heat the water. Add jaggery to it and mix. Leave it till the jaggery dissolves in it. Mix all the flours together in a big bowl. Add the oil and rub it in. Add chilli, ginger, garlic, ajwain, sesame seeds, turmeric powder, asafoetida, salt and sugar if using and mix well. Add the sour yogurt and water with jaggery. Mix everything together and form a dough. Cover the dough with a cling film or a lid and let it stay at room temperature overnight. The next day knead the dough well. If it is a bit stiff then add a little bit of water. The amount required will depend on the flours used. For me the measured ½ cup was enough. Put some oil in a deep frying pan or wok and let it become hot over high flame. In the meantime get everything ready for patting the dough. Take a flat tray or a big chopping board or use the back of a tray. Smear water over it. Cover it with a cling film or plastic sheet. You will need another one of the same size to cover the dough pieces for patting. You will need some water in a bowl, a small steel bowl or glass for patting, a slotted spoon and a colander with a small plate or tray under it. Divide the dough roughly into 40 to 45 parts. Wet your hands and roll them into balls as you go along. I rolled 6 and dipped them in the extra sesame seeds. Place the balls on the chopping board. Cover it with the other piece of cling film. Gently pat down the balls using a bowl or glass. 3 to 4 gentle taps with the bowl is enough. Remove the top cling film. Gently lift the corner of the cling film covering the board and flip the patted dough onto your fingers. Immediately place the patted dough into the hot oil. Repeat with the other patted dough. As soon as the dhebras rise, lower the heat to medium. Flip them over using a slotted spoon. Keep on flipping them gently till they all become golden brown in colour. Remove from the oil and put them in the colander. Serve them warm or cold with tea or yogurt. Keep on wetting your fingers to lift the patted dough. Remember you want fried dhebras and not fingers, so be careful. Pat them a bit thick as thin ones tend to break up and become very oily. If you are not using the dhebras immediately then while they are still warm, put them in an airtight container and cover it with the lid for 5 minutes. Then remove the lid till they cool down completely. This helps the dhebras to stay soft for a longer time. I have never made ones using tamarind paste, but you could use it instead of yogurt. Use about 3 to 4 tbsps of the paste and you will need extra water. Maize flour is very different from cornflour.Cornflour is the powdery one. You need actual maize flour or maizemeal, the one used for Mexican tortillas, for makki ki roti, for ugali etc. If you are not topping the dhebras with sesame seeds then add a bit more to the dough. For different types of dhebras add fresh fenugreek paste to the dough. Chop fresh fenugreek (methi) and grind it into a paste using little water. Very low heat will result in oily and flat dhebras, so keep on adjusting the heat from high to medium all the time. Pat them using your wet fingers if you want to.If you are using your fingers then you do not need the second piece of cling film or plastic sheet. Adjust the taste according to your preference. Don’t put too many dhebras to fry together as they will stick to each other and will not puff up. Small size wok or karai will take about 4 to 6 and bigger one about 6 to 8. Thank you. I am going to follow your recipe. Wonderful recipe, thank you, they turned out really nice and fluffy and were yummy! Wonderful recipe, turned out really nice and everyone enjoyed them, yummy!! Thank you very much. Do let me know how they turn out. Perhaps the oil was not hot enough or you may have patted them too thin.